When the nomination sheets are posted on the Student Council notice board write your name on your year group’s nomination sheet. Your nomination will need to be endorsed by a classmate (‘endorsed’ means that the classmate thinks you would make a really good student councillor). The student who endorses you might also want to be your Campaign Manager. (A Campaign Manager is someone who helps you with your campaign and works to get you elected). Nominations are open for five days (usually Monday to Friday). When the nominations close no-one else can add their name to the nomination sheet. The following Monday (after the Nominations have closed) the list of candidates for each year group is posted on the Student Council Notice Board. When this happens the candidates can begin campaigning. Candidates (with the help of their campaign managers) set about convincing their classmates that they are the best candidate for the job of Student Councillor. 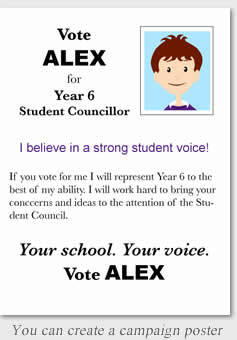 Campaigning means talking to your classmates about why you would be a good Student Councillor. Conduct a survey amongst your classmates asking them what is important to them, what concerns them, what they would like to see change and what ideas they have to make school life better. 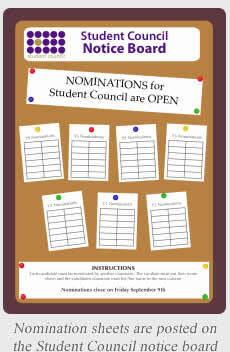 Produce a flyer saying what kind of Student Councillor you would be and what you would like to achieve. Set up a candidate station in the playground one break time and invite your classmates to come and ask you questions and talk to you about their ideas. Offer inducements, such as sweets or gifts, to your classmates in return for votes. Bully or be abusive or threatening to your classmates in order to get votes. Any candidate participating in prohibited campaigning activities may have their misdemeanours brought to the attention of Mr Krisson who has the authority to disqualify candidates. The other thing you may have an opportunity to do is to give a short talk to your classmates at a ‘Hustings’. A Hustings is a meeting where candidates have an opportunity to address their potential constituents and put their case as to why they are a suitable candidate to vote for. When every student in the school has voted the ballot papers will be counted and the winners of each class election will be announced. Q: If I am a candidate can I vote for myself? A: YES. It’s a secret ballot and you want to win, it would make sense for you to vote for yourself! Q: Do I have to vote for one boy and one girl? A: NO. You should vote for the two students on the ballot paper you think would be the BEST Student Councillors. A good Student Councillor is someone who will work hard for your class and for the school – someone who is committed, well organised and conscientious. Q: Do I have to vote for four candidates? A: NO. If there is only one candidate you want to vote for you can just vote for one candidate, however, it does seem a bit of a waste of a vote… What you must not do is to vote for more than four candidates. If you do your ballot paper will be classed as ‘spoilt’ and your ballot paper will not be included in the count. Q: My friend is a candidate, should I vote for them? A: IT DEPENDS. Would your friend work hard? Give up some of their free time? Be enthusiastic, creative and committed to being a Student Councillor? Are they more likely to do this than any of the other candidates? If the answer to all those questions is yes, then vote for your friend; if the answer is no, or you are not sure, then vote for someone else. That is why your vote is secret – you don’t need to tell anyone who you voted for if you don’t want to. Q: Are the younger students voting for the older students? A: NO. Student Council Elections are class elections; (it just happens that all the classes are having elections at the same time). Your classmates are voting for the two candidates in their class that they would like to represent them on the Student Council. Voting for your class representative is an important decision.